A beautiful day to be hiking! A stone chair right off of the parking lot. Today I decided to mix things up a little bit. Although I started on the Red Trail, after a mile I took a connector trail until it met up with the Leatherman’s Loop. The Loop eventually meets back up with the Red Trail which I stayed on literally for about 100 feet until I veered off to the left onto another connector trail which led me to a point further along the Red Trail. Here is where things got interesting. 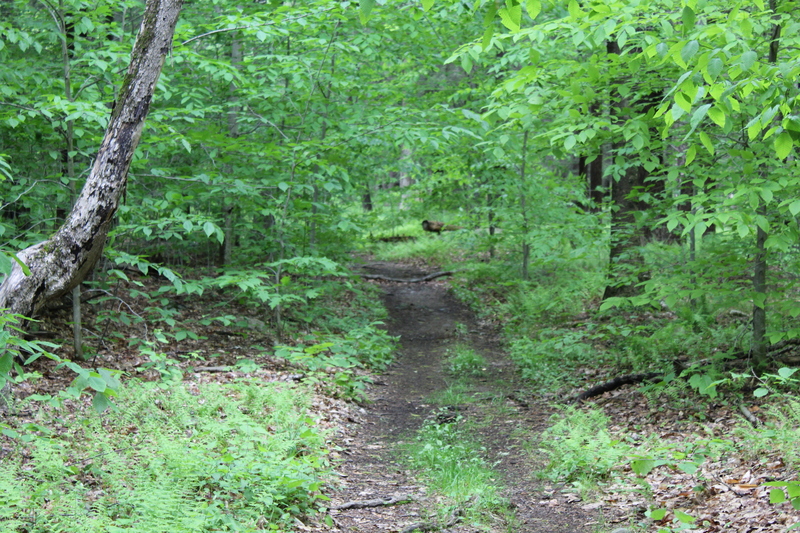 If you have followed my posts about Ward Pound Ridge Reservation, you know that the Red Trail is not that strenuous. It does have some inclines, but nothing that I would call difficult. With that said, I decided that at the 1.9 mile mark I would take another connector trail to the Rock Trail (RT). Not having been on the RT before, I wasn’t really sure what to expect. Although I absolutely love WPRR and its many trails, the only issue I have with them is that they do not have a map that adequately represents the demanding nature of some of its ascents and descents. I include the descents with this because they are actually more taxing on my legs than going uphill. The portion of the RT that I did today was a mixture of punishing uphills, even more steeper and punishing downhills as well as some nice flat areas. Meandering its way through the woods, the RT finally meets up with yet another connector trail that once again joins the Red Trail. Making a left, I stayed on the Red Trail until it met up with the RT. This time, however, you only stay on the RT for a very short time until you start hiking on the Yellow Trail. You will end the hike by following the Yellow Trail back to the parking lot. Although this hike was only 1.2 miles longer than yesterday’s, this one was much more demanding. With the addition of the portion of the RT, the added up and downs did a lot more to tax my legs than just staying on the Red Trail. With that said, it was more than worth the added exertion. This entry was posted in Uncategorized and tagged Hike, Hiking, red trail, Rock Trail, ward pound ridge reservation, westchester county ny on October 1, 2017 by The Zen Hiker.